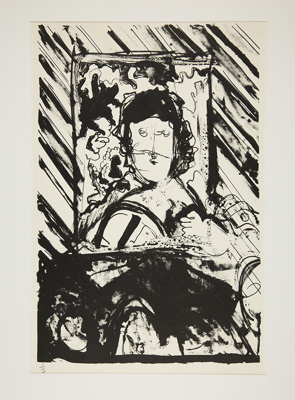 This lithograph is a variation of 1983:0059:0001 in black ink. It is a print combining both parts A and B. It shows a human figure driving with one hand visible and a steering wheel. there are diagonal lines across the border of the print, previously identified as streaks that look like rain. There are three copies of this print.